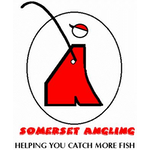 When I was at The Big One back in March, I picked up a pack of the new Ringers Spring Loaded Bait Punches and I’ve only just got round to being able to review them! 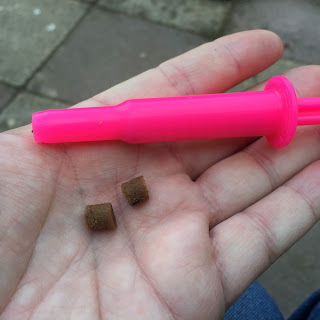 I’ve previously reviewed two Ringers products, the Pellet Pump way back in April 2013, which if you haven’t seen it yet, can be found here – Pellet Pump Review and remains my most popular post ever with 3257 hits! The other more recent review was of the Pellet Bander and you can find it here – Pellet Bander Review, both products are still going strong and the pump in particular has had a lot of use over the last three years or so. Each pack contains two spring loaded punches, they float and come in two hi-viz colours, an 8mm in pink and an 11mm in yellow. Each pack retails for £6.99. On opening the packaging, first impressions were good, the spring mechanism feels sturdy and should last you a good while although obviously only time will tell on that front. 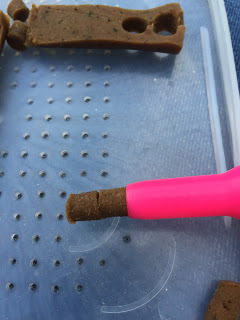 They are made of tough plastic that will withstand the rigours of everyday use but, like the Pellet Bander, you’re not going to be able to jump up and down on them! They shouldn’t come to any harm sat on your side tray though and you’d have to go some to lose them, given the vivid colours and the fact they float! 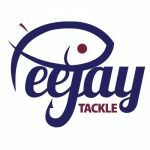 With a match at Summerhayes the following day I thought I’d punch some 8mm hookbaits using Old Ghost Hookbait Sausages (Snail flavour – yummy!). 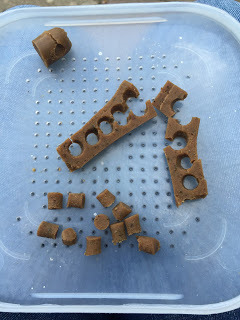 I cut the sausages in half and then punched the baits out two at a time and I ended up with some lovely pellet type hook baits. 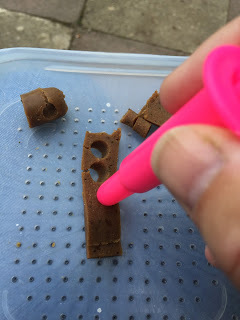 You can punch several hook baits at a time (depending on how thick you slice your meat) and the baits won’t dry out as you can push them out of the punch one at a time. They’re not just for meat though and are equally at home punching bread for dobbing on commercials in the winter and you can also punch three or four discs at a time for hair rigging to pop up on the straight lead. Of course I can also see these punches being very popular among river anglers fishing for chub and big roach. 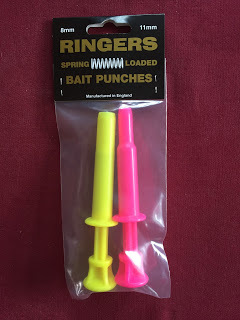 So yet another great, well thought out product from the Ringers stable and I will endeavour to update the review after I’ve used and abused them for a few months (although I’m not sure I’ll use the 11mm punch that much as I don’t catch fish that big! ).